This was once a quiet little book that snagged my radar when its beautiful cover released. I hadn't heard much about it when I first read it. Now it's all over the place, and well-deserved. He's debut is a forceful, genre-bending masterpiece inspired by Chinese history, with a generous touch of magic. I found myself gasping and white-knuckling the pages with every unexpected twist and turn. The astonishing ending left me desperate for a sequel. The beginning was a little disjointed, so stick with it. It starts well with Hesina finding out that her fther, the king, has died. She believes it was murder, and demands a trial. A soothsayer (one of the magic-users who were killed and shunned years ago, and must now live in secret) tells her that a specific criminal must be her lawyer if she wants to find the truth. It's an excellent set-up, but then the pacing gets a little choppy. It feels like the trial is moving way too fast to be the focus of the book. And that's because it's really not. Once He really hits her stride and the rest of the plot unfolds, it's a breakneck ride to the end. There's just so much that happens! He does a great job of managing all the disparate plot threads so that the plot feels intriguing and complex rather than overwhelming. Instead, we get a great sense of how overwhelmed Hesina feels. She's being forced to keep a brittle empire together while war threatens from a neighboring nation. Internally, an unknown spy threatens from within the court. She's at odds with a mother who openly reviles her and a brother who feels slighted. She feels pity for the soothsayers, who are being witchhunted as scapegoats for the king's murder, but cannot save them openly without courting rebellion. To top it all, she's starting starting to fall for Akira, her mysterious criminal legal representative, who may be her only hope in preventing powerful courtiers from using the trial to railroad innocents. And as Hesina does her own investigation, she finds that there is much about her family she never knew. Take nothing for granted! With every new reveal, He reveals herself to be a master of red herrings, foreshadowing, and secrets. Everything is connected. But even if you pick up hints along the way, you will, if you're like me, still be astonished at how it all builds to explosion at the end. The plot alone would make this book a worthwhile read, but it's strengthened with a foundation of believable characters and intricate worldbuilding. Yan is based on historical China, and He is good at giving enough details to make you feel embedded in the world without infodumps or over-explaining. In this inspiration she creates her own unique world, a world in which soothsayers were once depended on for fortunes and magic but were driven out by the mysterious forebears of Yan, the Eleven. Each chapter heading has a tenet from One and Two that comments subtly on the chapter content. And the way Yan's history relates to its present is so clever, I can't go into too much detail without spoiling. Suffice to say, He has solid sense of her world, and it shows. Hesina is a wonderful narrator. She's headstrong, stubborn, clever, selfless but sometimes a little self-absorbed, and all of this comes through strongly in her voice. You can see her stepping into traps, but you can also completely believe why the circumstances would lead her there. She's flanked by Caiyan and Lilian, her adopted siblings, her greatest supports, and interesting enough on their own that I wanted to know more about them. I also loved her brother Sanjing, a fiery warrior who resents Hesina's easy closeness with Caiyan. Their sibling dynamic is so contentious, so believably fraught with misunderstanding and stubbornness! When it came to romance, Akira is actually kind of lukewarm. I loved his moments of sarcasm and his clever lawyering, but I just felt a little too distant from him to be as invested in his relationship with Hesina as I could have been. On the other hand, I am totally invested in Sanjing's friendship with spitfire assassin Mei. But the romance wasn't a central theme, because there's just too much else going on to absorb my interest. 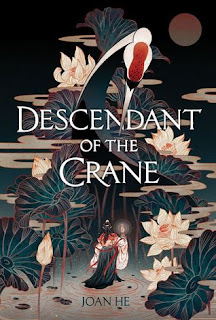 Descendant of the Crane is that rare fantasy that goes beyond the bounds of the genre to create something unique. 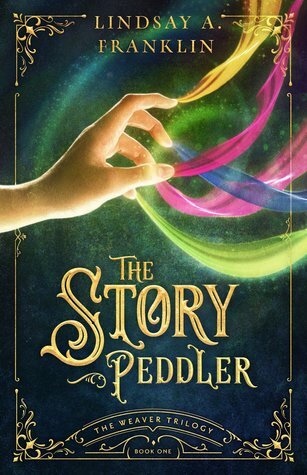 While magic is certainly a part of the story, the thriller-like plot takes center stage. It was an exciting, breathtaking read that grew on me the more pages I turned, and left me wishing desperately for a sequel. It's a world that feels homelike, and characters I came to know intimately. Don't miss out on this gem. He's debut is a forceful, genre-bending masterpiece inspired by Chinese history, with a generous touch of magic.